​Calamigos Ranch is only an hour’s drive from Downtown Los Angeles, but this sprawling, woodsy property feels like a complete world away. It’s situated in the Malibu Wine Country of the beautiful Santa Monica Mountains and features four different wedding venues that each have their own unique atmosphere. So whether you are planning an intimate gathering of 75 guests or a lavish wedding party of 500, there is a Calamigos Ranch setting to make your wedding day dreams come true. One of the most impressive things about Calamigos Ranch, apart from its whimsical, natural settings and vintage features, is that each of its wedding venues feels completely secluded and private. There may be up to three other weddings taking place at the same time at yours, but it always feels like you have the entire property to yourself. For intimate weddings, opt for the Oaks Deck, backed by a rock waterfall and elegant oak trees. Most couples use the nearby dining room for their reception, with 360 degree French oak doors offering natural light and a stunning view across the wild surrounds. Wrought iron chandeliers add a rustic touch, while the river rock fireplace will keep you warm on chilly nights. Nestled alongside breathtaking 100-year old Weeping Willows, the Birchwood Room is another idyllic venue for intimate weddings. The grassy ceremonial site is backed by a cascading waterfall, and the reception area features sprawling outdoor patios, adorned in Christmas lights and surrounded by oak trees. For larger guest lists, consider the elegant Redwood Room, the ranch’s most historic site, which features an original stone wall fireplace and vintage furnishings within its rustic interior. 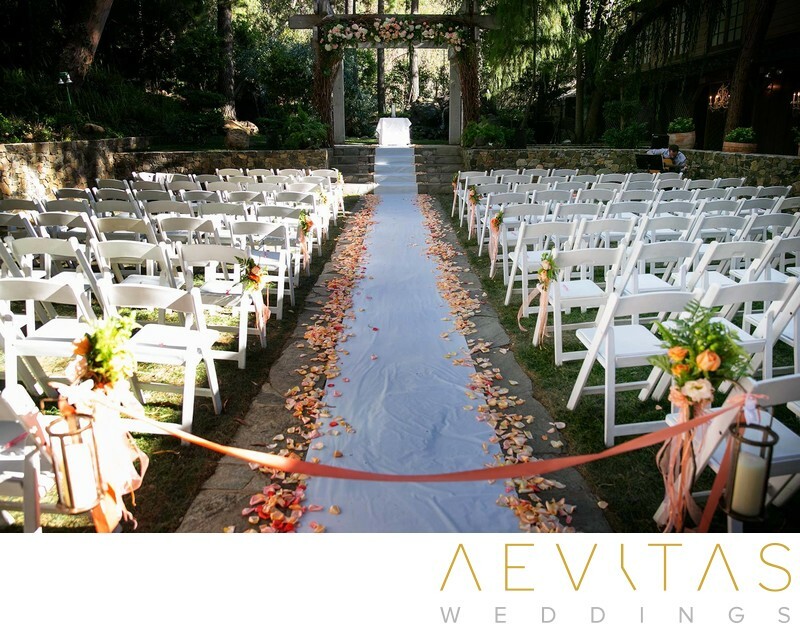 Chairs are set up along its ceremonial lawns for your guests to watch as you exchange your vows, protected beneath the shaded branches of redwoods and eucalyptus trees. For large wedding guest lists up to 500 people, The Pavilion at North Point is Calamigos Ranch’s most elaborate venue, with ceremonies held beneath a 100-year old Oak Tree. White drapes and twinkling fairy lights adorn its reception deck, with stunning views across the viticultural landscapes of the Malibu Wine Country. Calamigos Ranch has an experienced team of wedding coordinators and event organizers on hand to help you plan every detail of your special day, as well as on-site catering and beverage packages to make your wedding planning as stress-free as possible. The newest addition to the property, the Calamigos Resort and Spa, also means you don’t have to worry about transport at the end of the night, but can retire to one of their 36 beautifully appointed luxury guest rooms, each with their own terrace to take in the spectacular mountain views. With so many stunning natural features and luxurious touches, the Calamigos Ranch is a wedding photographer’s dream. In addition to its flowing waterfalls and sprawling trees, the romantic lighting and ornate chandeliers throughout the property transform into beautiful nighttime wedding portraits.